In the 1980s mounting restlessness in kanaka communities led to several investigations including the 1985 E Ola Mau Native Hawaiian Health Needs Study Report. *24 Publicly documented was the worst health plight of kanaka maoli compared to the other ethnic groups in our homeland. In 1986 a small nucleus of kanaka maoli health professionals, who had participated in the E Ola Mau Study, founded a permanent organization-E Ola Mau (Live On!) to reverse the health tragedy of our people. One result was the Native Hawaiian Health Care Act of 1988. 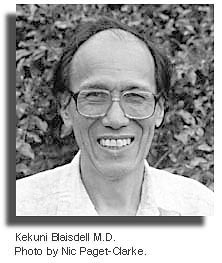 This U.S. Congressional legislation called for: (1) maximum participation by kanaka maoli, including traditional lapa'au healers, (2) Native Hawaiian health centers/systems established by Native Hawaiian organizations throughout Hawai'i for health promotion, disease prevention and primary health care; (3) an overseeing Papa Ola Lokahi five-member board consisting of E Ola Mau, state Office of Hawaiian Health, Office of Hawaiian Affairs, Alu Like, and the University of Hawai'i; (4) $19.6 million authorized over three years, with $700,000 appropriated in 1990-1991 for planning, but only $2.3 million in 1991-1992 for beginning health services.